An auction of a rare nature is being conducted through eBay. 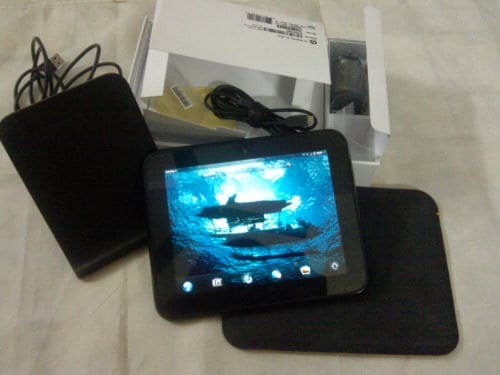 Rare because the item coming under the hammer is a 32 GB, 3G capable TouchPad Go from HP. The item is coming up from China and appears to be one that did not make it to the stores for sale at any time. Also, lest you have forgotten what the TouchPad Go is, particularly after the series of low cost 7 inch tablets that we have been bombarded with recently, it is a 7 inch cousin of the famous TouchPad tablet from HP. The TouchPad Go also runs the webOS operating system but is supposed to be working in all respects. The TouchPad Go had even made it to the FCC though unlike the TouchPad, never got to see the light of the day. Present bid count is just one and that is for $700. That is about $300 more than the new item. There is also the factor of webOS not being something that HP would continue to support. This is especially so given the fact that HP has been considering moving to the Windows 8 based tablets by 2012.